Well, this can't be good news for Microsoft, as a recent survey of Windows 8 users found that just over half of them still prefer Windows 7. The survey comes from Forumswindows8.com, an independent help and support site for the new operating system. After polling 50,000 active Windows 8 users, 53 percent of respondents said that Windows 7 is still their favorite Windows OS while only 25 percent said that they preferred Windows 8. When asked about individual Windows 8 features, fast boot up and shut down times came out on top with 56 percent saying it was their favorite feature. Easy installation came in a close second with 50 percent citing it as their favorite feature, while Internet Explorer was a distant third with 35 percent of respondents. 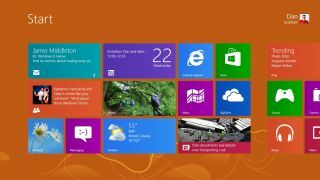 The much-touted Windows 8 UI (formerly called the Metro UI) came in further down the list of favorite features, garnering praise from only 22 percent of those surveyed. The charms bar, another Windows 8 staple, only resonated with 13 percent of users, and received the lowest ranking for favorite Windows 8 feature just above "other." According to the survey, the number one weakness to be improved in Windows 8 is the price, with 35 percent of respondents saying it is their biggest concern with the OS. Users will be able to upgrade to Windows 8 for only $39.99, or $69.99 at retail, for the first few months. However, in February after the promotional period ends the price jumps up to $199.99, which is where the price concerns may stem from. After price, the major Windows 8 concerns were system requirements and software compatibility, which were respectively listed as the top concern for 26 percent and 25 percent of respondents. It isn't all bad news for Windows 8 though, as the people surveyed said they like the idea of using the operating system on tablets. And, 35 percent said that the Microsoft Surface tablet was their first choice, compared to 33 percent saying Android and 26 percent wanting an iPad. Windows Phone 8 also beat out the iPhone with 29 percent saying they would prefer Microsoft's mobile OS compared to 22 percent favoring Apple's smartphone. Both were well behind Android though, with 42 percent saying they prefer it over either Windows Phone 8 or an iPhone. Windows 8 will be Microsoft's biggest shift for its operating system yet when it launches on Oct. 26. Although according to Intel, the OS may not be completely ready in time for launch, with final optimizations and improvements to get patched in after the fact.